Kim’s stock-list reads like a Who’s Who of iconic subtropical rainforest trees: black booyong, flame tree, sassafras, tamarind, rosewood, yellow carabeen, Moreton Bay fig, plum pine, corkwood – the list goes on and on. There are lines of potted Red Cedars, a species logged into commercial extinction in the 1800’s. Along the driveway, wild cedar saplings spring up around a parent tree that Kim planted twenty years ago. Tree-ferns, stag-ferns and fish-bone ferns germinate naturally in pots and under walk ways. The place is bursting with life. It’s not just the nursery and gardens that are impressive. Kim and Pete built their own character-laden mud-brick & stone home. Exposed beams and the extensive use of natural bush timber gives the house a delightful earthy feel. It seems to have risen organically from the hillside. There is so much to see here! Rugged Tapin Tops National Park, high on the Great Eastern Escarpment. Legendary Ellenborough Falls, a horsetail waterfall on the Great Bulga Plateau with one of the longest single drops in the southern hemisphere. 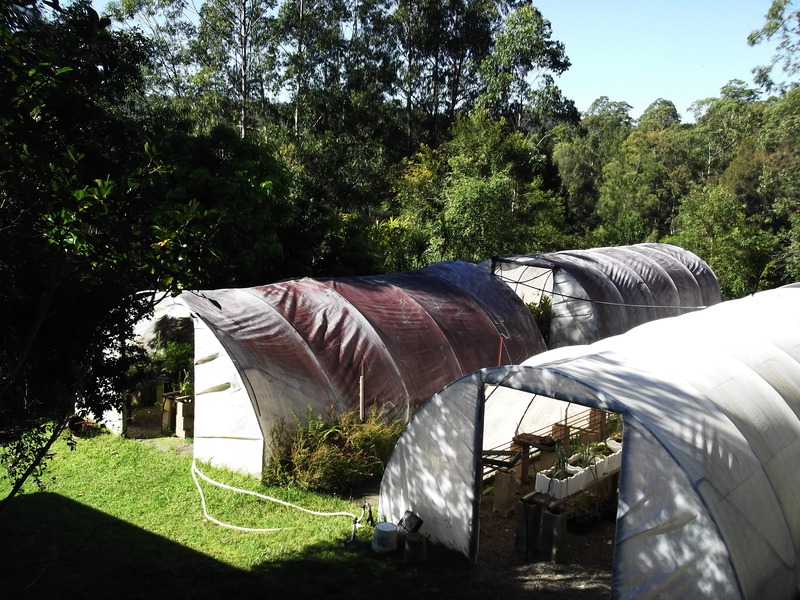 Or browse the stock at Tinonee Orchid Nursery, including a wide range of native orchids growing wild in the Manning Valley. Exploring this magnificent region with Kim as my guide has been an amazing experience. I hope I can translate some of this beauty into words.